Page 13: Mom’s name is Veronika. She is, or at least has been, a Pietist, which is less strict than being a Puritan, but still demands a lot of rigor. More on her later. The demands of children have softened her grip, a little. But that’s not saying much. The odds are that there have been other children in the Levy family that didn’t make it past a few months old, and the age gap between the boys and Liesl probably confirms that there were a few misses before the last kid took. However, this was all completely normal for the time, and somebody of Veronika’s spiritual and physical constitution would’ve muscled through without too much drama. Other women weren’t quite so lucky. Page 20: What’s amazing is that they actually have enough room upstairs for three bedchambers. Liesl’s nursery is about the size of a closet, though, and during the winter she sleeps with her parents. While the boys were both away, their room was rented out. It’s been repatriated since Luther came home – another hit to the family income. Meanwhile, Johann’s morning tune is a passage from Bach’s Goldberg Variations. Page 21: In the room are two crucifixes, a few token clocks and watches, one print of a famous woodcut portrait of Luther’s namesake Martin Luther (unwilling inciter of the Reformation), one print of the Ten Commandments, and an illustrated version of the passage in which Christ heals the hemorrhaging woman. Just like any boy’s room! In the 18th century, wall decor was pretty restrained and serious paintings were only for the rich, but almost everybody could afford the cheap prints sold by street vendors, with themes ranging from religious to literary to classical to bawdy. 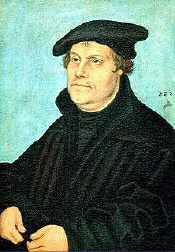 All of the books, with the exception of one or two devotionals and a couple of Bibles, are Luther’s student texts. Books were still very expensive despite printing technology, and large libraries were scarce outside of a few universities and the homes of the rich and eccentric. Students often had to choose between owning texts and eating hot food. Luckily Luther had a patroness to help out. Up on the neglected hat shelf are some of the circulated pamphlets from philosophical and theological circles at the time. The 18th century was a pretty good time for zine culture. Page 24: Fancy theology gets you nowhere with the guy who’s been smelling your night-time farts for the past quarter century. Page 26-27: Patronage was the best, but often most agonizing, way of getting through your education. Patrons could demand a lot of mindless boot-licking in exchange for minimal funding, much less full support. Or, conversely, you could be adopted almost as a member of the family. Either way, you were walking a wobbly line in which high performance and loyalty was demanded of you, regardless of how tired, hungry, or distracted you were. If you were without family connections, patrons were often your only means to get through your education and acquire a decent position in the Lutheran church (the only truly legitimate career for a theologian outside of a few very limited professorships). Absent that backing, you were looking at a lifetime of poverty and obscurity in a backwater parish. Patrons could be professors, your family’s employers, the local prince, a high-ranking cleric, or, in Luther’s case, a female Baron (“Baronin” – a “Baroness” is the wife of a Baron). Luther was the star pupil at the local Latin (grammar) school, and so came up for the honor by way of Pastor Altmann’s recommendation to the Baronin of Konstanz.